Great March for Climate Action – LA — For the Climate, for Clean Energy and Healthy Communities: We March! Photo By Mike Chickey. 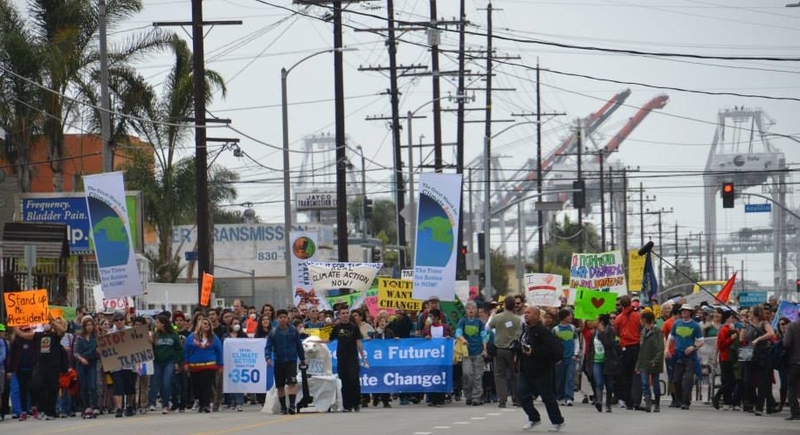 Great March for Climate Action – Port of LA, March 1st. LOS ANGELES – Inspired by California’s worst drought in 500 years, record melt of Arctic Sea ice, and worldwide extreme weather events, climate marchers braved much-needed rain showers to demand urgent national action on climate change. Led by SoCal Climate Action Coalition 350, Sierra Club and a wide coalition of over 100 groups, hundreds of activists and supporters held a rally hosted by actor and environmentalist Ed Begley Jr., with speeches from community leaders including LA City Councilmen Joe Buscaino and Paul Koretz. Children from schools all over Southern California joined a flash mob of the going-viral, “Sing for the Climate” and participated in a Climate Action Fair. Marchers at the same time set off from the Port toward Downtown LA and USC, launching the Great March for Climate Action – the largest national environmental march in history. Hundreds plan to continue their journey through the San Gabriel Valley and on to Washington D.C., out talking with everyday citizens along the way about how they can help solve the global climate crisis. The organizers chose to rally in the LA Harbor neighborhood of Wilmington, where over 650,000 barrels of crude are refined every day at the largest concentration of oil refineries in the state. Pollution also comes from oil drilling, ports, and diesel trucking, amid a proposed uptick in extreme drilling methods like hydraulic fracturing (or “fracking”) and shipping and refining of corrosive and toxic Canadian tar sands oil into Southern California. “We do not inherit the earth from our ancestors; We borrow it from our children.” — Chief Seattle. Photo By Jonathan H. Lee. “We deserve a future! !” Photo By Jonathan H. Lee. Activists voiced support for strong measures to preserve California’s water supply, coasts, and forests for future generations. With California facing a future of heat waves, droughts, wildfires, and sea level rise, this local celebration of a national march showed a growing groundswell demanding immediate action to ramp up renewable energy production and break our addiction to dirty, climate-damaging and polluting fuels.